The Heart’s intelligence is what we call on when we recognize the truth of who we are. When we share our authentic selves with others and make space for them to do the same, it is our Heart that allows us to recognize that authenticity and to feed our soul-to-soul connections with it. 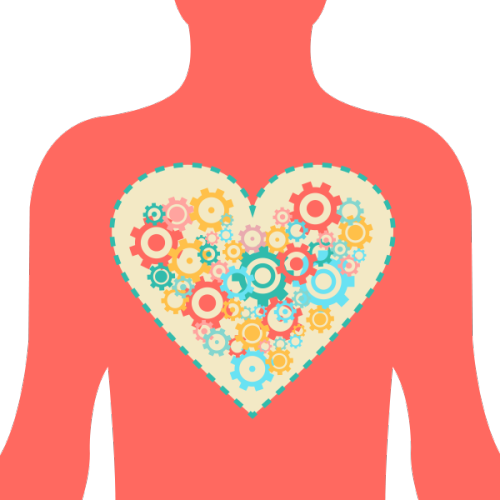 As mentioned when we discussed the Belly Center, Heart-only connections are superficial, so they must first be grounded in the Belly. But it’s the Heart that shares the truth of who we are and revels in the truth we find in others. Russ Hudson says the Belly gets us here, but the Heart tastes what’s here and detects the texture of the moment. Because we’re talking about the Heart, we’re essentially talking about love. By love, I don’t mean the cheesy, saccharine variety we find in greeting cards and chick flicks. I mean the terrifying, powerful, cleansing, compassionate, healing love. The love that scares the hell out of us and strips us naked, having torn away our masks and defenses. The love that frees us. The reduction of this love in our society to saccharine sentiment I think points out our fundamental terror of letting go of our masks and defenses, our limited sense of self. Who would we be without them? We are cynical about the existence of unconditional love and we feel so unlovable and unworthy at our cores that we must weaken and tame the true nature of love to a cartoonish facsimile. In doing so, we not only allow our egos to stay firmly in place, but we cheat ourselves out of the experience of being fully bathed in love’s purifying power. This purification does strip us bare, but what it’s removing is all the junk and limiting self-definitions we’ve allowed our souls and psyches to collect. It’s this pile of junk we normally point to and say, “this is me.” But love comes along and throws it all in the garbage where it belongs. What we are left with is that which is truly worthy and most authentically us. And because we’ve been stripped, we can finally see it. So does this mean that we have to wait for the right person, the perfect relationship to come along and free us? Absolutely not. This is another distortion brought about by our distrust of our own value. We look within, and finding nothing worthy of value (because to some extent we don’t trust our own value judgments and require validation from others), we project onto some mythical savior the job of seeing us as valuable and thus redeeming us. This “frees” us to sit idly by, waiting for them to come along. It is utter nonsense, but notice how prevalent this idea is in our culture. The task of the Heart is to learn not to reject ourselves, to not turn against our true nature in favor of some imagined “self” that is somehow more valuable. This is how we love ourselves and no one can do it for us. In the awakened Heart, we find the true nature of unconditional love. It is as if a light engulfs us and flames outward from our Hearts to bathe others in the healing love channeling through us into the world. Here we also realize our connection to the whole and our role as the greater Self as the concerns of the little self we’ve always taken ourselves to be lose their ability to entrance us and fall away quite effortlessly. When the Heart Center is balanced and healthy, its Essential qualities express themselves through us effortlessly. Some of the Essential qualities of the Heart Center are love, truth, delicacy, authenticity, impressionability, poignance, preciousness, mystery, beauty and gratitude. Because the Heart is concerned with the revelation of our true nature and recognizing the true nature of others, the primary issue surrounds identity and the right to be valued. However, through the process of ego-splitting, we lose connection with our Heart Center. We have no experience—or can’t trust our experience—of feeling valued for who we really are at our deepest core. Because we don’t have that experience, we make the cognitive error that our true nature wasn’t valued because it’s not valuable. We become concerned with the question of “if I can’t be valued for myself, then who do I need to be to be valued?” Ego creates a fantasy self and this is the image we trot out to receive our experiences of feeling valuable. However, it never touches our Hearts because it’s not who we really are and deep down we know this. There’s a sense of worthlessness, deficiency and catastrophic emptiness that causes profound suffering. In this void, Ego substitutes emotional reactivity, narcissism, identification with things, love of the false self and an expectation that we will feel valued when someone or something outside us gives us the validation we seek. 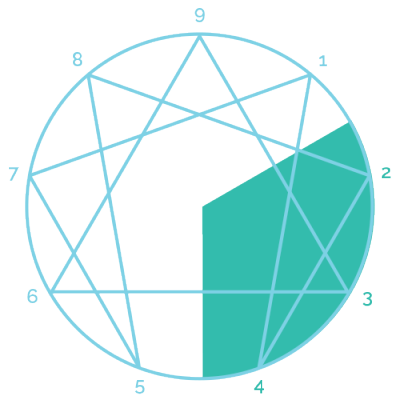 The types in the Heart Triad reside on the right of the Enneagram and include types Two, Three and Four. These types are looking for a sense of their own fundamental value, and the primary affect is shame which is the natural response of Heart energy when we have no experience, or can’t trust our experience, of our true nature being valued. We must note here that these types are not the only ones that experience the issues of the Heart Triad. They’re simply the types whose egos are structured around the reactivity that results from a disruption in the experience of fully connecting with the Heart. The Two experiences the loss of connection with the Heart as all the love in the universe having been taken away. They over-expresses Heart energy and in a sense say, “if there’s no love, I’ll be the one who brings it.” Twos have highly active superegos which demand that they be “good” or risk being without value, so they repress their negative feelings, which they believe make them “bad,” and only acknowledge and express the positive ones. They become effusive, warm and friendly, continually offering up affirmations and compliments to let others know how much they care about them. Depending on the Level of Health, Twos will demand in return that others recognize their value in specific ways. However, they can’t ask for this recognition directly, so they drop hints and expect others to respond. The less healthy they become, Twos may become hostile and resentful if they don’t get the precise validation they’re looking for. The Three is the most disconnected from the Heart Center and both over- and under-expresses the energy. They experience the loss of connection with the Heart as a verdict that their true nature is valueless. There’s a sense of being empty on the inside and so Ego constructs a house of cards to cover up this perceived lack of value—from the world and themselves. They over-express the Heart energy in a projection of a valuable self to the external world, and they under-express by compartmentalizing their emotional life so that they can get on with “becoming” this more valuable self. They do experience their emotions, they are indeed very sensitive people for the most part. But they don’t allow their emotions to get in the way of their performance. This causes the Three to avoid looking within, and depending on the Level of Health, Threes also avoid getting too close in relationships because they don’t want anyone else looking in there, either. The Four experiences the loss of connection with the Heart as having lost everything that is most honest, real and authentic in themselves. They’re left feeling like they have no permanent sense of identity, no unique value. There’s a sense of having been rejected or abandoned because of it. Of all the types, the Four is the most aware of the falseness of Ego, but instead of following that notion, they instead turn to Ego to manufacture a sense of being real and authentic. They under-express the energy of the Heart by going inward in search of something real and true to plant their “this is me” flag into. Because their emotions have a sense of immediacy and truth, they attempt to find a stable sense of self there. But because emotions are constantly changing it’s like trying to build a house on shifting sand. Depending on the Level of Health, this leads to identifying with the negative feelings (because they feel more real than the positive ones) and building an identity around being somehow broken, damaged, or deficient yet sensitive, passionate, unique and authentic.